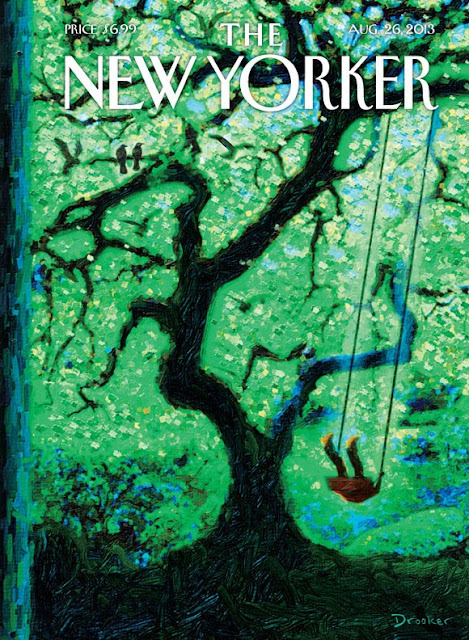 In this week's edition of The New Yorker, Eric Drooker shares his thoughts on what inspired the painting featured on the cover. “This tree is really a fantasy of a city boy. An eternal summer of the mind, if you will,” Eric Drooker says about this week’s cover. “I was born and raised in New York City—and the city has changed a lot over the decades,” he muses. When asked about his recent endeavors, he tells us, “I give art lectures while playing banjo and harmonica along with it. What I remember from art history class is that I would always start falling asleep, because you’re in a dark room, very comfortable, and you just see these pretty pictures going by. So that’s the lesson I learned from art school: that you gotta make it more energizing than that.” – from New Yorker's website.